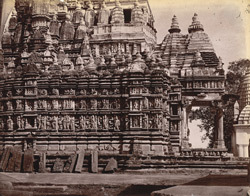 Photograph of a close view showing mouldings and sculptural details on the facade of the Parsvanatha Temple, Khajuraho, Madhya Pradesh from the Archaeological Survey of India Collections, taken by Joseph David Beglar in 1871-72. From the the Parshvanatha Temple is a large Jain temple from the mid-10th century of the Chandella period. A tall spire consisting of clusters of miniature towers dominates the whole building. The outer walls of the sanctuary and of the mandapa are decorated with panels of fine sculptures of Vasihnava themes as well as amorous couples. Jina figures are carved on the lintel of the interior doorway.